Lexus has come one step closer to building the amazing new RC sports coupe. The company announced today that the car will be on display at the Tokyo auto show in 3 weeks. Two months back we reported on the RC and we included a photo from a mostly forgotten concept rendering that Lexus had made back in 2012. We speculated that it would be the design of the new RC coupe, and we were correct. For an image of that vehicle please see our prior story. When Torque News first reported that Lexus might build the RC 2-door sports coupe based on the hugely successful IS 350, it was mostly speculation. It made sense for the company given that the IS 350, and its slightly less aggressive IS 250 sibling, were to be a big part of Lexus’ push to add excitement to a brand that had started to “age” a bit. However, many companies will bring a sporty version to a car show just to get traffic to their display and try to stir up interest in their more mainstream cars. On the contrary, Lexus seems committed to the new RC and it has announced the drivetrains and the interior features. The drivetrains are an interesting choice for Lexus. Although the IS 250 has been the volume leader in the IS line, Lexus is not talking about that engine as an option. Instead, it is showcasing the IS 350’s 3.5 liter engine, which presently offers about 6 HP more than the BMW 335i sedan and 435i coupe. For those interested in a sports coupe, this Lexus 306 horsepower engine is an excellent choice. It will be mated to the aggressive, yet frugal Lexus-designed, 8-speed, manu-matic locking torque converter transmission that has now migrated from the IS-F to the IS 350 sedan. We have also speculated that the new RC might come in an RC-F version with the Lexus V8 which produces almost exactly the same horsepower and torque as the newly announced BMW M3 and M4 engine does. However, at this point the Lexus announcements have not mentioned that. It would be typical car marketing to introduce the more mainstream engines first and then come out with a more power version about a year later. Almost every car maker does that. The new RC is going to have the new hybrid engine found now in the European version of the IS sedan called the IS 300h. This could explain the absence of the smaller “250” V6 in the new RC. The hybrid will offer more power and much better fuel economy than the small V6 can, and will also be a lower CO2 output vehicle. If Lexus has made anything clear recently it is that hybrids will be part of all new models. For those not familiar with the current IS 350, we should emphasize that the car is rear-wheel drive and available as a coupe/convertible as well as a sedan. The new RC would surely take over as the convertible platform. Lexus decided to build the IS 350C convertible on the older platform for one more year (model year 2014) rather than discontinue it, and we had pointed out that must mean it will continue on. Otherwise when Lexus upgraded the IS 350 it would have killed the convertible car then. Sales of the new 2014 IS 350 and IS 250 are simply exploding, so more variants of the car would seem to make good business sense. In terms of the exterior design the photo says it all. What might not be obvious from the photo is that the length of the new RC 350 is 184.8 inches. That is about 2 inches longer than BMW’s 3 Series coupe (now discontinued) and the new 4 Series coupe which has a length of 182.5 inches. The new Lexus RC is also about an inch wider and within a half inch of the new 4 Series’ height. In a side by side comparison the Lexus will likely appear to be the car that is more sporting in stance. In an effort to bring more bling to the fight Lexus is planning to offer a new paint technique as well. The paint is a multi-step process that uses more layers of clear and deeply pigmented color coats. The result is a brighter shade with more contrast to exterior trim. Inside Lexus is introducing many firsts on the RC. Its lighting is all-new and will radiate upward instead of downward. Interior colors will offer much more contrast than in prior Lexus designs. A new wood material called shimamoku will offer highlights to the car’s interior. This wood is a layered product designed by Lexus to offset surrounding trim pieces. The seats will be manufactured in a new way as well, trending in the direction of racing seat construction. The overall interior theme is added class, while at the same time offering a more youthful and cutting edge environment for the driver. For decades car publications would compare a BMW costing thousands, or tens of thousands of dollars more, to a competitor’s car and then award the BMW the overall win. Motortrend did exactly that this year comparing an AWD version of the BMW 335i costing about $62K to the new Lexus IS 350 AWD costing less than $50K. However, some major publications have started to award the win to the Lexus, even though it comes with a much lower price tag than the BMW. Notably, both Car and Driver and Road and Track picked the Lexus IS 350 over the BMW 335i. 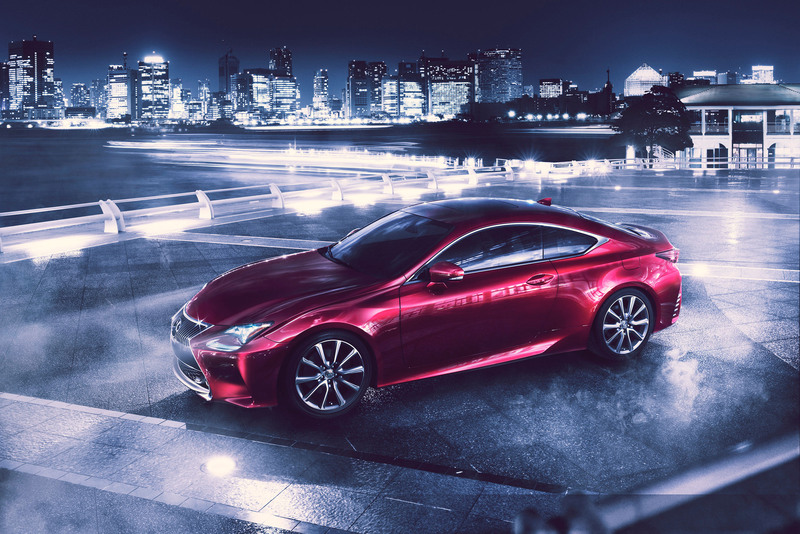 With the new RC coupe slated for a possible 2014 release, those comparisons might soon be a matchup of the RC 350 and the BMW 4 Series coupe. If the price models hold, the Lexus will be priced comparably to the BMW 428i and the Lexus will enter that fight wider, longer, and with about 60 more horsepower and 2 more cylinders than the new BMW. The new Lexus RC 350 and RC 300h coupes will be on display at the Tokyo Motor Show starting November 20th at 8:45 am. If you plan to view the vehicles you should arrive early or you may find yourself standing behind a row of very nervous looking German gentlemen.